Frank Lloyd Wright, Six Buffalo Houses (Publisher not noted. This booklet is an outgrowth of the former Louis Sullivan Museum�s 8 year campaign to save the Guaranty Building.) Randall, John D.
1992 Architectural Monographs No 18: Frank Lloyd Wright (Soft Cover) (First published in Great Britain in 1992 by Academy Editions, London. Published in the United States by St. Martin�s Press, New York) Heinz, Thomas A.
Frank Lloyd Wright: Presentation and Conceptual Drawings (Set of four CDs) (Produced by Luna Imaging, Inc. and the Frank Lloyd Wright Foundation and Archives, Dist. 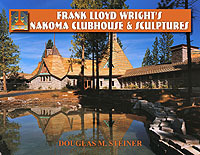 by Oxford University Press) Luna Imaging, Inc. and the Frank Lloyd Wright Foundation and Archives 5,000 digital images. Original set List Price $1,250.00.